Circumstances have brought us to an odd place, where we can simultaneously consider the horrors of an old war, one that’s a hundred years gone and that was supposed to end all wars, and also our grim present, in the form of an unfolding environmental calamity. The mountainous northern Italian province of Trentino was part of Austria-Hungary until 1919. It formed the frontier between Austria and Italy, and was the site of almost continuous harsh fighting throughout the First World War. That war, known as the Great War, or briefly (until it was overshadowed) the World War, is a sad yet instructive and cautionary story about how nationalism, jingoism, and inept diplomacy can lead to disaster. The Great War is receding far into history now; no known veterans of it are still alive, and few of us ever met an eyewitness (I did; I was very young but even then knew it was a great honor. I still consider it so). World War I might as well be a Napoleonic war, for all the relevance it seems to hold today. But it shouldn’t be that way, because the sickening uniqueness of that war, how it started and how it was fought, should never be forgotten. Where our modern wars are clashes of cultures, that war was a jousting of homogeneous European aristocrats, who thought a war would be a grand way to strengthen their respective empires, and who spilled the blood of 30 million casualties for that futile, ultimately self-defeating, goal. I won’t rehash too much history here. I recommend interested readers pursue their own study of the causes of World War I (I heartily endorse LaFore’s The Long Fuse). Suffice it thus: this is a war that started with an excuse, a street crime. It steamrolled from there, inexorably toward disaster, because the men charged with leadership couldn’t or wouldn’t muster the courage to stop it. It didn’t have to happen; it shouldn’t have happened. But it did. Trentino, with its Ago de Nardis mountain, has been a peaceful corner of Italy since that war – it was relatively untouched even during World War II. The battles fought there between 1915 and 1918, horrid though they must have been, were relatively unimportant compared to the campaigns in France and Russia and the Middle East. They were almost forgotten. Until this summer. 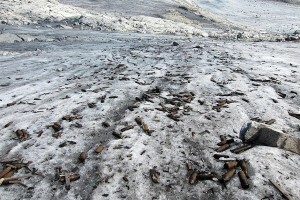 The glacier covering Ago de Nardis, once permanent, has melted and has revealed a stark reminder of what the aftermath of war looks like. 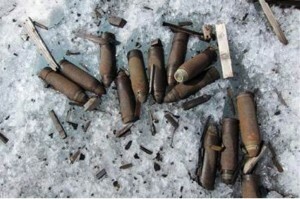 Over a piece of ground more than 100-meters squared, century-old artillery shells, ammo casings, and every other kind of battle detritus have emerged into sunlight, probably for the first time since shortly after the fighting in which they were used. I don’t know what if any lessons are to be learned here. I just know that everyone should look at those pictures and ask questions. The questions that come to my mind are on vastly different subjects, but have frighteningly similar themes: Why did that war have to happen; why couldn’t it be stopped? and Why is that glacier melting? Why can’t climate change be stopped? In 1914 failures of leadership brought on a war that threatened the future of civilization itself. Today there are ongoing, ever-unfolding failures of leadership that are threatening to do even worse. The arguments against the reality of climate change are idiotic, technophobic, and are a little like arguing against the existence of icebergs from the deck of the Titanic. Even if industrial emissions aren’t the main culprit, and even if it’s too late to mitigate the worst consequences, the price of inaction – and most importantly, of endless argument – are far too high. By contrast, if we start today, right now, leveraging all resources at our disposal to reverse what’s happening to our planet, the hoped-for outcome would be worth whatever price we pay. And even if we fail, we’ll at least know that we tried. Maybe it’s a stretch to conflate World War I with global warming. Some will undoubtedly think it was crass and opportunistic of me to do so. All I can say is that when I see these pictures I’m not seeing an opportunity to rant about the thing that keeps me up at night. I am seeing the thing that keeps me up, and in this context it reminds me of another time when missed opportunities and narrow vision led to ruin, misery, and death. This entry was posted in New Post and tagged Ago de Nardis, climate change, global warming, Italy, World War I. Bookmark the permalink.